Naz is currently booking upcoming shows and private events…so stay tuned. 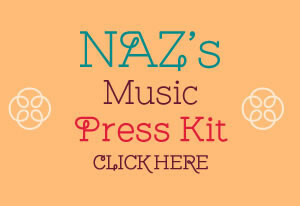 If you would like to inquire about inviting Naz to sing at your venue or upcoming event, click here. I’m honored to return to the VO Atlanta stage for my 3rd year. This time, I’ll be swingin’ with my talented friends Sam Skelton, Tyrone Jackson, Justin Chesarek & Craig Shaw on stage at the ipDTL Swing Dance Party! This event is reserved for VO Atlanta attendees only, so get registered. This event will be broadcast live world-wide to virtual attendees of the conference too. There’s still time to inquire about attending the conference or viewing the live concert broadcast online. Subscribe to my Youtube Channel for live concert performances featured on #NazLive. For my latest whereabouts & updates, like Naz Fan Page on Facebook. I’m honored to return to the VO Atlanta stage with my talented friends Sam Skelton & Tyrone Jackson to sing some of my album favorites & some special music arrangements in this intimate concert reserved for VO Atlanta attendees only. This event will be broadcast live world-wide to virtual attendees of the conference too. There’s still time to inquire about attending the conference or viewing the live concert broadcast online. Subscribe to my Youtube Channel for live concert performances featured on #NazLive. For my latest whereabouts & updates, like Naz Fan Page on Facebook. Enjoy a musical night to benefit the NE and McCleskey YMCA featuring some of Atlanta’s best musicians at Sacred Tapestry (by the NE Y on Johnson Ferry). You will be amazed at the variety and amount of talent in one event! Tickets may be purchased at the door for $10. I’m very excited to announce that I will headline at Churchill Grounds, Atlanta’s legendary jazz café and live music hotspot. I will feature some amazing musicians and debut new arrangements. Attend for a chance to win a FREE CD. Advance reservations are encouraged. To make a reservation, please call (404) 876-3030. Tickets are $15 at the door, so please arrive early. Check out live concert performances on my Youtube Channel featured on #NazLive. For my latest whereabouts & updates, like Naz Fan Page on Facebook. Drive-By Big Band is back in session from a summer hiatus. I sing every 4th Sunday of the month with Drive-By Big Band, featuring Atlanta’s top musicians. Food, Fun, & FREE Jazz for the family!! Friend us on Facebook: Drive-By Big Band . Need a singer & a big band for your next event? Click here to see videos and booking details. Enjoy a musical night to benefit the NE and McCleskey YMCA. You will be amazed at the variety and amount of talent in one event! I will be accompanied by guitarist Trey Wright & bassist Craig Shaw. Tickets may be purchased at the door. It is such an honor to return to the stage this year with Georgia Symphony Orchestra Jazz for this special performance alongside Atlanta’s best musicians led by the incredible, Sam Skelton. This year will be very special as I sing jazz classics by Georgians with Audrey Shakir. This will be an unforgettable evening. Attend for a chance to win FREE CDs and a pair of Sennheiser Momentum headphones. Click here to purchase your tickets. Enjoy stage side dining and experience the magic of the music at this gorgeous restaurant in the heart of Vinings. I will perform my favorite tunes and a blend of jazz, contemporary, and Latin-inspired arrangements from my recently released album, Time After, in an intimate concert with pianist José Manuel Garcia. Call (770) 937-9089 to reserve your table or click here to purchase your tickets. Seating is Limited. Like Naz Fan Page on Facebook for the latest whereabouts & updates. I am singing some big band tunes and a few tunes from my recently released debut album with Hot Shoe Records recording artist Joe Gransden and his talented Big Band. Don’t miss it! Enjoy dinner while Joe & I sing with his Smokin’ 16 piece Big Band for a swingin’ evening of Jazz. Check out a video from my first show with him in March. I am booked to perform at a wedding with a big band. Click here to learn more about inviting me to sing at your next event. I will be teaming up with Alvin Stone to sing our favorite songs from The Great American Songbook in an intimate concert featuring jazz pianist Louis Heriveaux at Hungry Ear Coffee House located at NWUUC. Fresh from releasing my debut album with 2 SOLD OUT performances, this special concert is not one to miss! CDs will be available. Check Naz Fan Page on Facebook for updates. Click here for directions. I am booked to perform at at a fundraising event to benefit victims of domestic violence. Click here to learn more about inviting me to sing at your next event. 2 SOLD OUT SHOWS at The Velvet Note!! Super excited to feature an All-Star cast of my friends and favorite Atlanta musicians: Tyrone Jackson (piano), Sam Skelton (sax & reeds), Craig Shaw (bass), Justin Varnes (drums), and Emrah Kotan (percussion). See you there! Click here for tickets and info. I sing every 4th Sunday of the month with Drive-By Big Band, featuring Atlanta’s top musicians. Food, Fun, & Free Jazz!! Like Naz Fan Page on Facebook for the latest updates. I am a guest vocalist with The Matthew Kaminski Organ Trio. Matthew Kaminski is the official organist for the Atlanta Braves and an amazing musician! See you there! Such an honor to sing with Georgia Symphony Orchestra Jazz for this special performance to present incredible jazz music in Marietta! Join us for an unforgettable night of music. I will be performing at a private fundraising event for the Atlanta Women’s Foundation. Thank you for hiring me as the featured vocalist at your event. Truly honored and excited to be performing with Sam Skelton’s Quintet for The Arts Council Evenings of Intimate Jazz Series. I sing every 4th Sunday of the month with Drive-By Big Band, featuring Atlanta’s top musicians. Food, Fun, & Free Jazz!! Like Naz Fan Page on Facebook for my latest whereabouts & updates. Super excited to have Hot Shoe Records recording artist Tyrone Jackson and Grammy Award-winning saxophonist Mace Hibbard to perform at this corporate event. Thank you VO Atlanta 2014 for the wonderful opportunity to perform at your opening reception. Singing some big band tunes and a few arrangements from my upcoming debut album release with Hot Shoe Records recording artist Joe Gransden and his talented Big Band. Tickets sell out Fast! Don’t miss it! Come join Joe and his Smokin’ 16 piece Big Band for a swingin’ evening of Jazz. You’ll hear arrangements from the songbooks of Sinatra, Tony Bennett, Count Basie, Ray Charles, Wes Funderburk and others along w/Joe’s originals. Joe has put together 16 of the finest jazz musicians in the Southeast to bring you an evening of great Big Band music.